This morning I got up early, around half past six. So I switched on the television to entertain me while setting up my stuff for the day ahead. In addition to the typical morning news programs on some channels, there was also a clear amount of children's programs that made me think was this the source for all that energy the Japanese get to overcome the hectic day ahead of them? Like in almost any other Japanese tv-program, bright colours were used and the hosts were speaking in an excited, fast, high pitched voice like they were about to burst from the sheer joy they radiate from their faces. So with my mind packed with bright smiles and happy tunes, I left the ryokan and decided to explore the local urban area a bit before heading downtown. The local streets of Oha-ku proved that there was a total lack of proper city planning, with the grey two-four storey buildings camouflaged with narrow stairways and balconies. This type of architecture was certainly different from the streets of Helsinki. While heading to the Chidori-cyo station, I noticed a parked black mercedes that had its back seat windows tinted black. It was a yakuza car, no mistake about that. There the driver was sitting inside the car, keeping the engine running, but I decided not to see what he was waiting for and kept on walking since the yakuza aren't exactly tourist attractions. Once I reached Kamata via train and wandering around that area briefly too, I proceeded to Shinawaga, which is one of the many stations along the Yamanote line (a train line that makes loop around "central" Tokyo). Shinawaga station's default noise was backed up by a few women advertising ADSL connections, wearing special campaign clothes (typically their skirts were kind of ... um, short). I ordered breakfast in a cafe located in the station. After paying I was given a number token. I went to the other end of the oval counter and showed it to another person behind the counter, who arranged the breakfast items on the tray (see picture on the right). After finishing breakfast, I wandered around Shinagawa station for probably half a hour before I found the Yamanote-line! Finally getting on the Yamanote-line, I decided to jump off at Shibuya. Now Shibuya was a cool district. As no surprise there were a host of high buildings around, but the real delight were the smaller buildings shattered around the area. Lots of small restaurants, fashion shops and "love hotels" that were decorated with all kinds of styles one after another. Really a hip atmosphere and the people hanging around the area were too. As I wandered around the area, my pockets were filling up with free tissue packages with an advertisement inside. This was because some people were constantly handing these over to other people passing by. These turned out to be useful afterwards, as many public toilets didn't have any paper to dry your hands. At some point I didn't have any idea where I was, but it didn't matter as every corner of the street had something exciting to offer. I settled for lunch in a pasta restaurant before seriously trying to find my way back to the station. By using the tall buildings as navigation points, I found my way back to the station and jumped on the Yamanote-line for Ikebukuro. There I searched for a JR travel agent office, as I wanted to pick up my Japan Rail Pass I'll be using from tomorrow on. When I received the JR Pass, I noticed that the year was marked according to the Japanese year, 14. The Japanese year is made of the each reigning emperor. So now it's the 14th year of the current reigning emperor (Akihito). Ikebukuro was less funky than Shibuya, but was interesting nonetheless. There were a lot of electronic shops and I compared prices of the products between Japan and Finland. Since my digital camera's 128MB memory card was already reaching its limits, I bought another same sized memory card. At some point I had enough of examining electronic devices and made my way back to Kamata. Before returning to the ryokan, I stopped by a bar for a beer (this later turned out to be the only alcoholic drink I took during the whole trip!). Checking what I managed to buy today were five CDs - two from Missalina Rei, one from Ayumi Hamasaki, one from Shiina Ringo and one single from Laputa. They were all secondhand CDs and cost around 1500 yen (the single was 150 yen). A full price for a Japanese CD would have been around 3100 yen (about 26 euros). One interesting thing was that singles in Japan are sold in the 8cm format. So that was that. Shibuya was cool and Ikebukuro was also worth visiting (although I really haven't seen much of Tokyo so far). 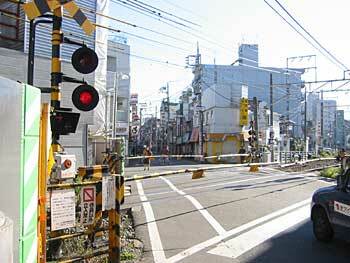 One striking thing about Tokyo was the sense how safe the city was for a metropolis of its size. No matter how big or small, bright or dark the street was, it felt safe. It really is a remarkable thing to experience. Tokyo must be the safest metropolis in the world - if you don't count the fear of the next big earthquake. After more terrible late night tv-programs, I went to bed (or futon, a rollable cushion-like mattress) a happy gaijin in Tokyo. 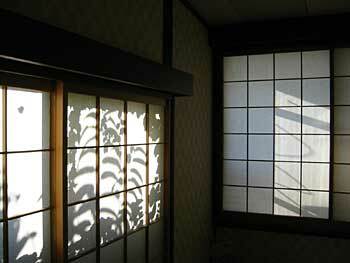 If these kinds of morning shows don't get you kick started for the day, at least you can comfort yourself by knowing you haven't totally lost it yet..
Once again in my room in ryokan Kangetsu, what a beautiful shadow cast on the windows. The suburban scenery close to the ryokan. 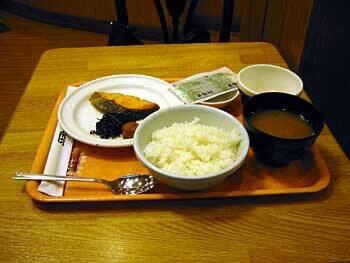 A simple Japanese breakfast: rice, salmon, soup, a half raw egg and some sea weed (I think). 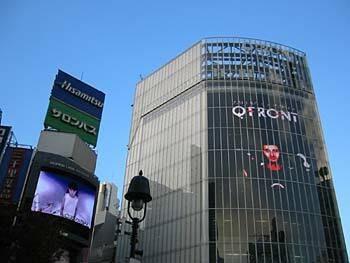 Shibuya had lots of video screens to make sure you keep bumping into signposts and other people. 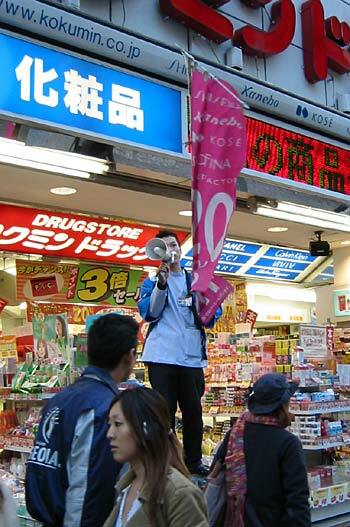 A shop assistant campaigning with a megaphone and flag how great and cheap their products are. Yamanote line - Probably the most useful trainline in Tokyo, since it makes a "loop" around central Tokyo. Japan rail pass - With this one can use almost any JR train for free for 7, 14 or 21 days (including most shinkansen trains! ).